Well, it turns out that wedding planning along with a not-so-new job takes up a lot of time. My creative time has been hard to find, and admittedly I've lacked the mojo to create once I've found a spare moment. So today's little card (measuring 3x3) gives you a sneak peek of sets, Joy to the World and Most Wonderful. This card also lists the three things I plan to do for the festive season and for this weekend too! I've travelled over to Caryn's and we're both helping Stephanie as Clearly Besotted Stamps attends the Happy Stampers Festival today! We'll all be tired tomorrow, but nothing waits for a special occasion - stay tuned to find out more tomorrow...! As always, please pop across to Stephanie's to check out even more sneaky peeks and links to the rest of the amazing CBS Design Team with fabulous creations including our guestie, Jen Nelson! Thanks so much for stopping by here and apologies for the tumbleweed in between posts! So happy to see you here my friend...cas perfection! I love your card, very easy to mass produce! Thanks for sharing! Very nice cards. I really like your chalkboard card. I really like your little card! 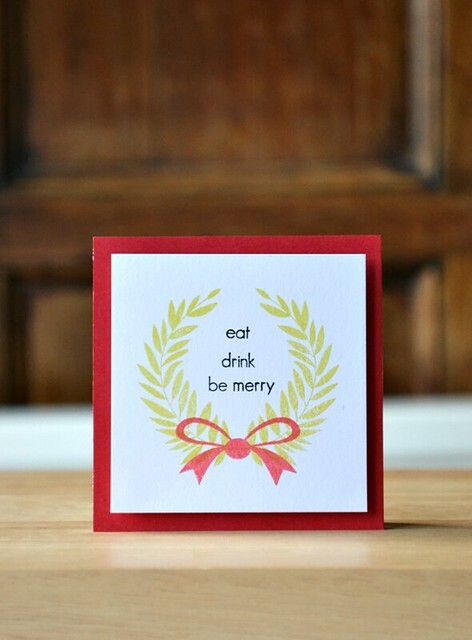 Love the Eat, Drink, and Be Merry card you did. Especially enjoyed yr comment of 3 things you plan to do...lol. A festive challenge & a winner!